The buzz is out. The Internet of Things, Industry 4.0, lean manufacturing, and OEE for manufacturing are all hot topics for our industry. Machine monitoring is one way to measure what you have before you can start improving, but what does it take to get started? Is it affordable and compatible with your equipment? What about Cloud-based products that are low-cost and hosts data offsite? If you haven’t yet been persuaded, it’s likely because you’re wondering what exactly happens to your data. Many customers have turned to our Cloud-based solutions not only due to low cost, the ability to get email or text notifications of production issues, and no long term commitments but also because of proven reliability. One of our customers stated they were able to run their five-axis CNC machines for 24 hours a day to increase productivity instead of investing in more machines. That’s a big deal! “By 2020, a corporate ‘no-Cloud’ policy will be as rare as a ‘no-internet’ policy is today,” states Gartner, which is a highly respected information technology research company. As the current workforce in manufacturing grapples with a mass departure of experienced workers who are retiring, a younger workforce that is likely more adaptive to modern technology trickles in. 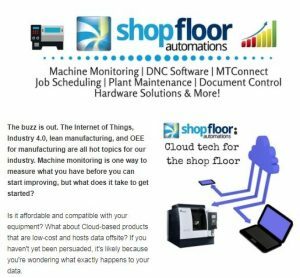 If you’re still on the fence about Cloud-based tech for your shop floor, read this blog from our site where we map out how exactly your data is handled for DataXchange machine monitoring. We also have this interesting blog that discovers how IIoT and Cloud tech can help cut down on maintenance costs and help with the current manufacturing skills gap.